For a glimpse into rural life in Ireland in the past, we paid a visit to the Bunratty Folk Park in Bunratty, County Clare. The Folk Park is set within the grounds of Bunratty Castle and is one of the most visited sightseeing attractions of Ireland’s west country. The village houses and shops that make up Bunratty Folk Park have been chosen from many different areas of Ireland and they form a collection of typical 19th century rural Irish buildings and architecture. The buildings range from the large landlord’s house to the smallest peasant’s cottage. There’s also a school, a pub, grocery, hardware shop, post office, a smithy, watermills and a fine collection of old farm implements. Through these buildings visitors get to see a collection of Victorian village buildings in Ireland’s past. With your entrance fee to the Folk Park, you are provided a leaflet with which you can do a self-guided walk to learn about the buildings and its inhabitants. Some of the buildings belonged to famous people. An example is Hazelbrook House which was originally built in 1898. This was the home of the Hughes Brothers who produced HB ice cream, a household name in Ireland. At Hazelbrook House, visitors can learn about the evolution of ice cream making in Ireland and also the history of the Hughes Brothers family and their HB brand. Another highlight building of the Folk Park is the Ardcroney Church. This original Church of Ireland building was moved stone by stone from Ardcroney in Co. Tipperary and rebuilt in Folk Park. During the summer season, costumed characters wander through the streets and demonstrate traditional crafts and trades, such as bread baking, weaving and pottery work. We called into the School and chatted with the school master who was very keen to show his cane. School was out so he was happy to have a long chat about life in Ireland in the past. We also met a Bean a Ti (woman of the house) and she was another absolutely friendly ‘inhabitant’ of the Folk Park who gave us some insight into how life had changed in Ireland during her lifetime. She was so lovely and reminded Tony of his grandmother. Bunratty Folk Park is particularly popular with families and schools and it’s easy to see why. There are lots to see and explore here and it’s a great learning environment for children. Had we more time at this place we would have loved to have chatted with the other people in the village and perhaps have a drink at Mac’s, a working pub at the top of the village street. Located right between the City of Limerick and Shannon Airport, Bunratty Folk Park is also a stop for all tours of the Irish West or Southwest. 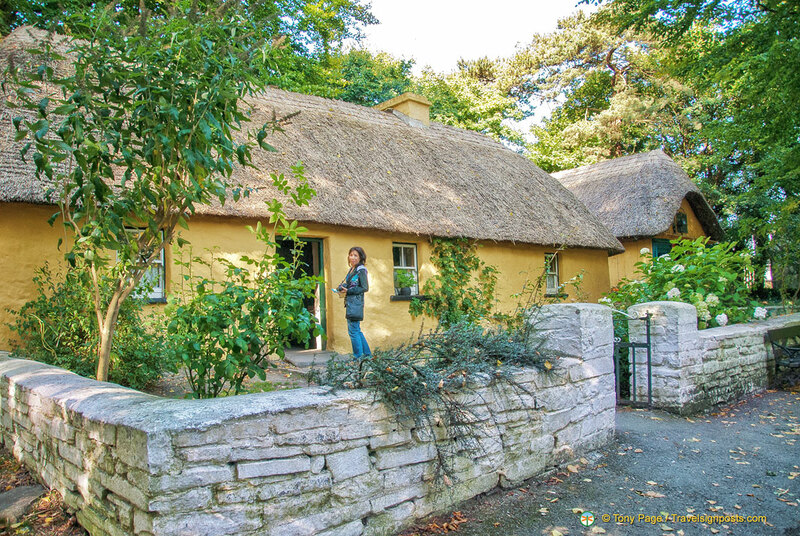 Take a tour of Bunratty Folk Park with Travelsignposts Photos HERE. Nice article, but, other than “somewhere in Ireland” where is Bunratty Park? Bunratty Park is next to Bunratty Castle in Bunratty, Co. Clare. If driving, it’s located just off the N18 Limerick/Ennis Road (just ten minutes from Shannon Airport). See map above.